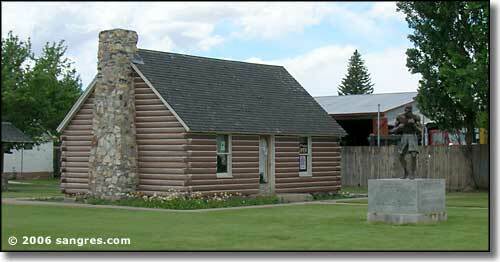 Manassa is the first Mormon settlement in the southern part of the San Luis Valley. When the Mormon colonists first came to this area, they tried settling in several different spots but the groundwater situation in this part of the San Luis Valley is a bit different. Sometimes there was no groundwater at all, sometimes their settlements turned into swampland. Manassa was a place where everything came together nicely for them and they prospered. Today, about half the residents of Manassa are descendants of those original Mormon pioneers while most of the other half of the residents are descendants of the Hispanic families that came to this area in the early 1850's to settle the Sangre de Cristo and Conejos Land Grants. The settlement at Manassa was founded in 1879 and named for one of the sons of the Israelite, Joseph. This particular chunk of land was chosen because the town fathers had been guaranteed that the Denver & Rio Grande Railroad would be built through town. However, in 1880 the railroad decided to run their line through the settlement of Romeo, 3 miles west of Manassa. While that didn't help the business development of Manassa, it also didn't stop the population growth and Manassa is now the largest town in Conejos County. Manassa is on land that is essentially perfectly flat. Just east of town is where the San Luis Hills begin. In the first set of low hills is the location of the King Mine, a turquoise mine that produces a striking green turquoise in a golden, non-webbed matrix. This mine was originally mined by the Ancestral Puebloans maybe a thousand years ago, and it was rediscovered by I.P. King in 1890 as he was prospecting for gold in the area. Manassa is also the birthplace of William Harrison "Jack" Dempsey, one of the greatest heavyweight boxing champions in modern history. In 83 fights he lost 6 times and won 62 times. Among his wins were 50 by knockout, 26 of those knockouts happening in Round One. He also had 9 draws and 6 no contests. The log cabin where he was born and grew up in is located on Main Street in Manassa and is now the location of the Jack Dempsey History Museum. Main Street is also State Highway 142, also known as the Camino de Los Antiguos Scenic & Historic Byway.